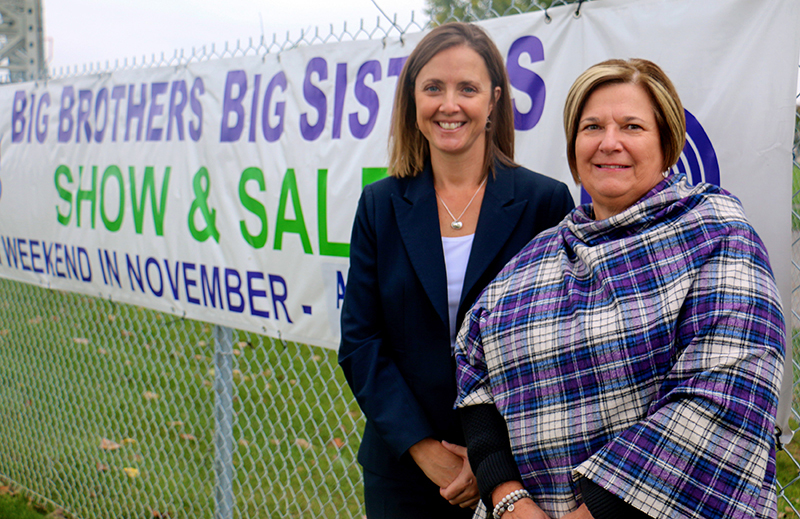 Cathy Wilde knew she wanted to have an impact when she signed up to be a Big Sister in Sarnia 15 years ago. But she had no idea just how much that relationship would change her. “When people talk about Big Brothers and Big Sisters, they talk about how much the youngsters get from the mentorship in their match — and that’s tremendous,” said the local lawyer, who joined the agency after moving here from Saskatchewan. After being matched in 2002, Wilde and her Little Sister, Roberta, were inseparable. They climbed trees, went to amusement parks, “and did all of that fun stuff you love to do as a child,” said Wilde, who even taught her how to drive. One of their most treasured traditions, said Wilde — who also served on the agency’s board of directors — was the annual Show and Sale, a popular vendor event and flagship fundraiser in Sarnia. “My Little Sister and I would always volunteer there, and my mom, who lives in Saskatchewan, would actually plan her annual visit to Sarnia around the Show and Sale so that she could come volunteer, too,” said Wilde. Her law firm, Fleck Law, is the title sponsor of this year’s event, celebrating its 45th year. “It’s been going strong and building over the years to what it is today,” said Jackie Vandenbroek, staff co-ordinator for the upcoming event, to be held Nov. 11 and 12 at Alexander Mackenzie secondary school. Some $55,000 is raised annually from the event, supporting Big Brothers Big Sisters Sarnia-Lambton, which, along with matching adult mentors with area youth, also provides a number of services including in-school mentoring, after school programs, Go-Girls (geared towards ages 12-14), and Big Bunch (supporting children on wait lists). There are about 120 current matches, with an additional 75 children on the waiting list, Vandenbroek said, noting some 800 youth are reached annually through various programs. “It’s a challenge every year,” she said, adding that about one-third of the agency’s funding comes from the United Way, with no money from the government. As for Wilde, her Little Sister is all grown up now with a family of her own, has graduated college, and is a nurse. Though their match officially ended when Roberta turned 18, the pair still remain close. “She stood up in my wedding; I was there when her daughter was born,” she said. WHEN: Saturday, Nov. 11, 9 a.m. to 5 p.m.; Sunday Nov. 12, 11 a.m. to 4 p.m.